This one is for a cheap thrill and not for anything tactically relevant ... Still, the context is based on real events. During the 2008 South Ossetian War of 2008, the Russian troops took advantage of what appeared to be a general withdraw of Georgian troops and quickly seized the town of Senaki. The small airbase at Senaki was also raided. The overall effect of this move was the isolation of the port of Poti, which was some ten miles west. 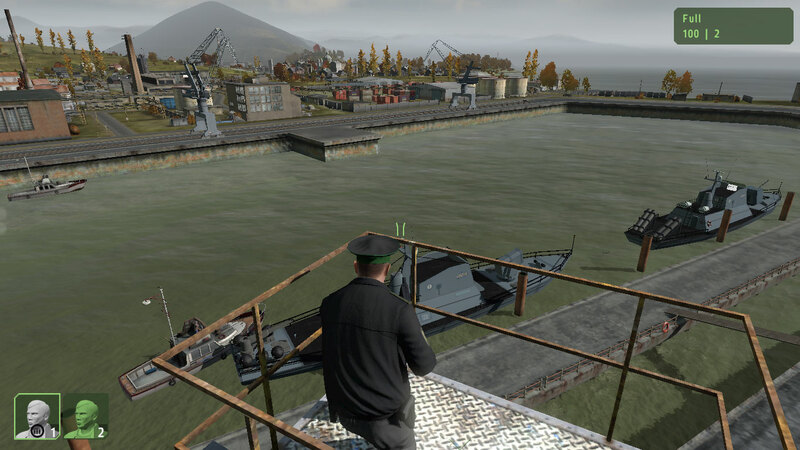 On the afternoon of August 12, a squad of the Russian 45th Independent Airborne Reconnaissance Regiment entered the port of Poti and blew six Navy and Coast Guard Georgian vessels. These vessels included the fast attack craft Tiblisi and Dioscuria. The humble Russian squad sunk almost the entire Georgian Navy. ... the Georgian civilians were not up to peacefully tolerate the damage to their precious port? 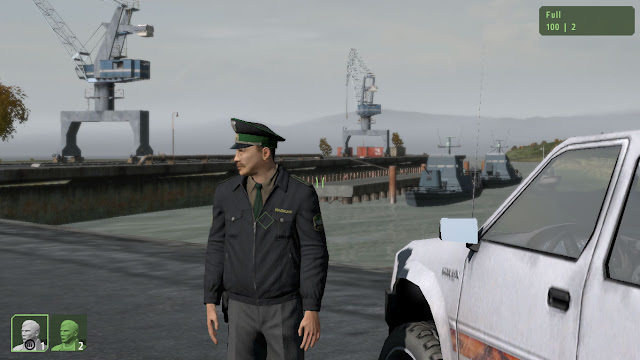 Enter two Georgian police officers from the city of Poti, who are irate about the damage to the port's infrastructure and civilian vessels. Forget the Georgian Navy, forget the Georgian Army! They abandoned them, and they are not willing to loose everything without a fight. Back to the two police officers. They knew the Russians were coming. 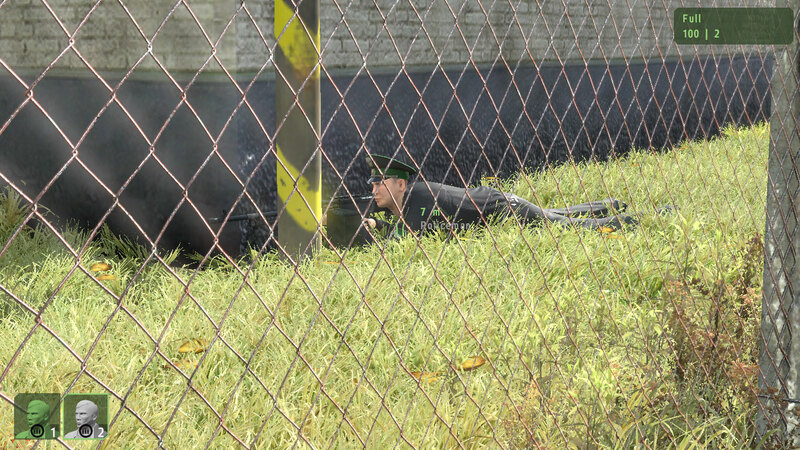 They have gathered as much as they could from Georgian troops routing from the Russian onslaught at the Senaki airbase. Most of the hardware they couldn't use because of lack of training. Vehicles, including American HMMWVs, were bullet magnets. But a couple of M240s were a good compromise of portability and firepower. This is where the scenario starts. I play as any of the two police officers (using this trigger/script trick that allows you to switch from one guy to the other without messing the position of the guy you are switching from). A panoramic view of the port facility. The Georgian Navy vessels are in the foreground. The Russians will be advancing all along the pier in the other side of the water. Getting low and assessing the fields of fire and cover from one of the many positions available. The enemy route of advance is at the far background (in front of the buildings on the pier on the other side of the water). 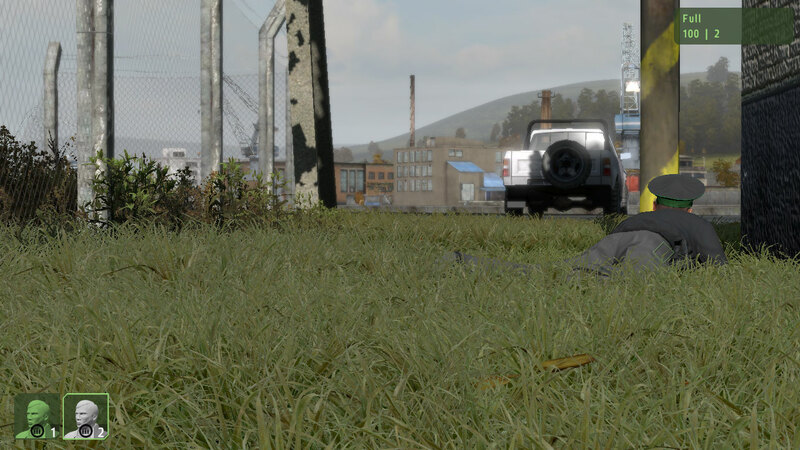 This position looks fantastic and it would allow us to score some kills. But as soon as the Russians shoot back, we would be in serious pain. The same firing position as above, from a different point of view. Note the location of this computer controlled bot: between a pole and the wall. I positioned him myself by switching to him, moving and then switching back to "myself". This precise positioning of friendly AI brought to you by the script mentioned above. 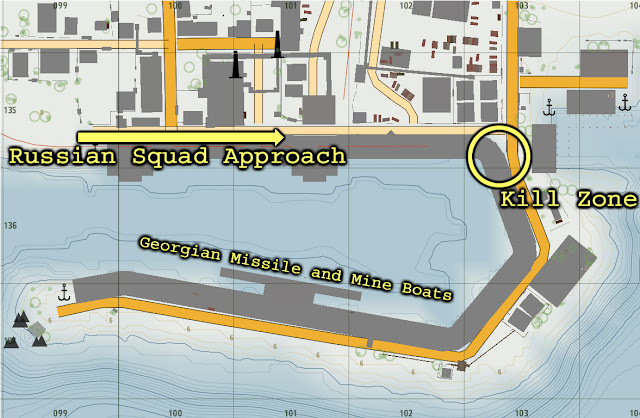 After discarding firing positions on or along the pier where the Georgian Navy boats are anchored (the enemy would be responding fire as a whole squad), I settled for the kill zone indicated above. In theory, if we fire onto this kill zone from the northeast, this would allow us to engage fractions of the total enemy force at a time.